Despite statements of Russian and Belarusian officials that the Zapad-2013 military drill is defensive in nature, some western analysts are convinced that Moscow is flexing its muscles towards Eastern Europe. A joint military exercise of Russia and Belarusia code named Zapad 2013 (West 2013) will be held on September 20-26. According to the representative of the Russian Ministry of Defence Vyacheslav Usik, the Russian Armed Forces will contribute 2,500 troops, while Belarus will send 10,400 servicemen. Some 60 aircrafts and helicopters and upto 250 combat vehicles will be involved on both sides, he added. The military drills will take place in Belarus and in Russia’s Western Military District, as well as in the Barents and Baltic seas. 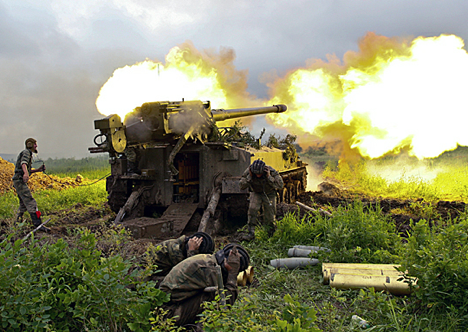 Zapad-2013 has already raised concerns among Russia’s and Belarus’s neighbours. Despite the Russian Ministry of Defence’s statement the drill is focused on the defence of the Union of Russia and Belarus, some western politicians and analysts are sure that the joint drill is aggressive in nature. These concerns are heightened by the decision of Zapad-2013 participants to not allow NATO representatives to attend the exercise. Latvia’s Minister of Defence Artis Pabriks said on July 19: “We want Russia to invite us to take part in the exercises and we’ll be able to observe them and give an assessment”. The minister believes that the exercises would imitate the attack on the Baltic States. “I don’t believe that such scenario will differ from the previous one (Zapad-2009), although it has its nuances. In any case they will be aimed at our region,” Pabriks said. The defence minister said he is worried about Russia’s military active efforts and its presence in the Baltic region. Similar concerns are shared by Lithuanian officials. According to the 2012 report of the Second Investigation Department under Lithuania’s Ministry of National Defence, there is a possibility that not only defensive but also offensive operations may take place at the Zapad-2013 drills, as well as intentional and non-intentional violations of the Lithuania’s land and air borders. Military activity in the Western direction is treated by Lithuania’s military Russia’s demonstration of military power. Is the Russian military moving towards more transparency? Poland’s military representatives shares Baltic concerns over the Russian-Belarusian military drills and the overall geopolitical situation in the region. General Roman Polko, former commander of Poland’s special operations unit GROM and deputy head of the country’s Bureau for National Security told Polsat TV on June 10 that Russia threatens both Poland and Belarus and that Zapad-2013 will have an “aggressive character” towards neighbouring NATO states. Earlier this year Poland’s Defence Minister Tomasz Simoniak stated that Warsaw would prefer a return to “good old NATO” and the US decision to cancel the fourth phase of the European missile defence shield reflected Washington’s “hesitation” In Europe. From their part, Russian and Belarusian politicians have already stated that the conducting of the Russian-Belarusian strategic drill threatens no one. Belarusian president Alexander Lukashenko said in February his opinion about the West’s statements and speculations about the exercise in the form of ‘threat from the East’: “I’d like to underline that we are not going to threaten anyone. We don’t consider any country our enemy. We have a defence doctrine and the law clearly states it. “We don’t accept the policy of threats and dual standards. It is the power and clarity of our foreign policy. We act openly and consistently, focusing on collective defence,” Belarusian Telegraph Agency BelTA the leader of Belarus, quoted Lukashenko as saying. Based on RIA Novosti, ITAR-TASS, BelTA, The Lithuania Tribune.